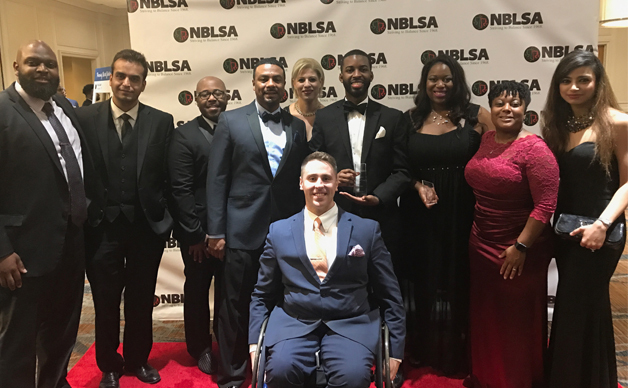 Emory’s Black Law Students Association (BLSA) has, for the second consecutive year, won National Large Chapter of the Year at the 49th Annual Convention in Houston Texas. The chapter of the year award is given to three chapters: small, medium, and large for excellence in: advocacy, community service, socio-political awareness, pre-law division/alumni relations, career development, regional and national programming participation (mock trial, moot court), and international relations. BLSA board members, during which he talked through the legacy of the Emory Law chapter and presented a scrapbook documenting the year’s events. Both the interview and the scrapbook (themed “The Road Less Traveled”) were scored and compared with other large BLSA chapters such as NYU Law, George Washington Law, and Indiana University Maurer School of Law. Although all the chapters were excellent In their own right, Emory was able to edge out the others because of the unique programs such as the HBCU Admissions and outreach initiative, the social advocacy protests and demonstrations, BLSA members’ leadership in organizations throughout the school, and the legacy of prominent alumni and ability to attract notable civil rights icons such as US Representative John Lewis (D-Ga.) and Cornell Brooks, the CEO and president of the National Association for the Advancement of Colored People (NAACP). Tayler Bolton 17L also received the Best Petitioner Brief for Frederick Douglas Moot Court competition out of more than 50 teams nationwide.